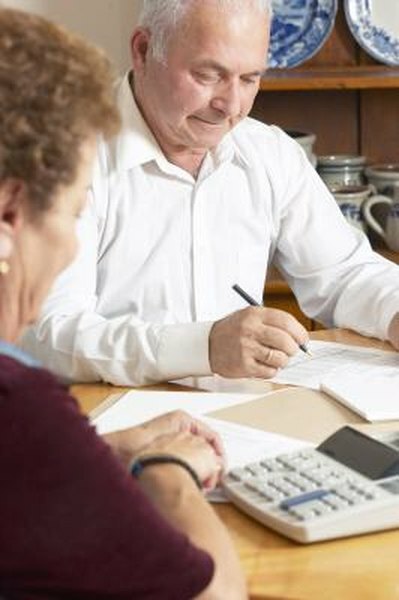 A joint and survivor annuity provides income to your surviving spouse. 1. What Happens to Your Pension if You Die Before You Retire? 2. Is a Widow Entitled to a Deceased Husband's Pension Benefits? Less common than they once were, pension plans promise monthly income at retirement based on a formula that usually includes your years of service with an employer. For this reason, they are also known as defined benefit plans to distinguish them from defined contribution plans. With the latter, benefits are based on the money available in your retirement account from contributions and investment income. This makes the point at which your benefits will expire under a pension plan a little easier to predict. However, it will still depend on the benefit payout you choose, and some are more open-ended than others. The Employee Retirement Income Security Act of 1974 requires pension plans to follow a "vesting" schedule. Vesting is simply the portion of your promised retirement benefit that you own. The two options are 100 percent vesting after five years of service, with none before that, or vesting that begins after at least three years of service, with 100 percent vesting after seven years. Employers can choose more liberal schedules. Once you are vested in part of your benefit, you are entitled to it even if you are no longer covered by the plan. However, you will be required to wait until you reach your earliest retirement date under the plan to collect the money. The single life annuity option provides you with the highest monthly pension benefit. If your plan promises a certain percentage of your highest five years of salary times your years of service, that's what you will receive. A single life annuity expires immediately upon your death. This means if you are married, your surviving spouse could experience a significant reduction in income if you were receiving a high benefit. If a pension offers benefits in the form of an annuity, the default option for married retirees typically must be a "joint and at least 50 percent" survivor annuity, unless the spouse agrees to a waiver. What this means is that your monthly benefit will continue over your lifetime and if your spouse is still living at your death, she will receive 50 percent of that benefit over her lifetime. After that, benefits expire. Most plans also offer a "joint and 100 percent" survivor benefit. Because benefits continue after the retiree's death, the lifetime benefit is reduced. The greater the survivor benefit, the more that reduction will be. Some pension plans offer what is called a "life and period certain" annuity. For example, you might choose "life and 15" or "life and 20." In this case, you are entitled to benefits over your lifetime but if you should die before a certain period, your named beneficiary will receive benefits until the period expires. This is usually your spouse. The expiration of a lump-sum benefit will be the hardest to determine. If you take a lump sum, the pension plan will pay you the "present value" of the benefits an actuary calculates you would receive over a normal life expectancy. So a lump sum is essentially a gamble. If actuarial tables say you're expected to live until 85, and you live to be 90 or 100, you will probably have lost out by taking a lump sum. On the other hand, if you only live to 75, you got more out of the lump sum than you would have from an annuity. Then there's the investment factor. Present value is determined using certain investment income assumptions. If you can beat those assumptions by investing the money yourself, you could come out the winner. If your benefit value is $5,000 or less, the IRS allows plan administrators to pay you a lump sum whether you choose it or not. CNNMoney: What Payout Options Do I Have? Can a Beneficiary Be Paid the Monthly Benefits on a Pension Plan When the Member Is Deceased?